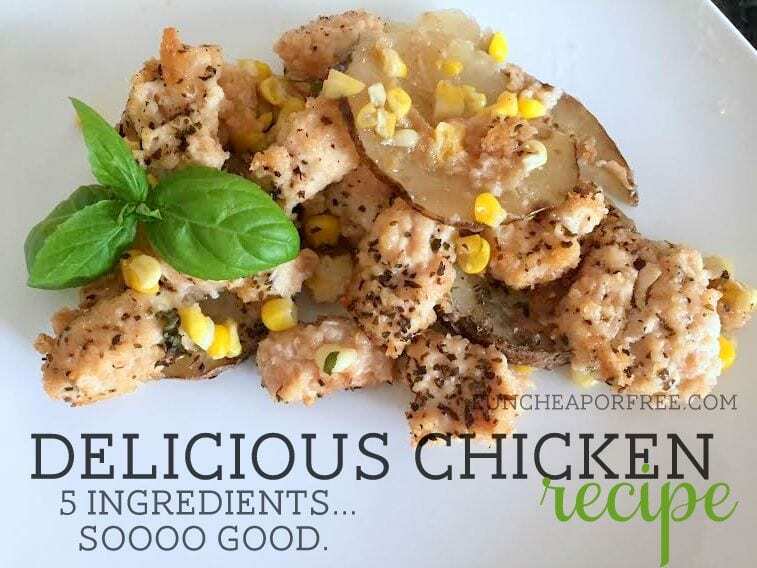 “Delicious Chicken”: A 5-Ingredient Family Favorite Recipe! All you need is 5 ingredients, some seasonings, and 1 pan to make this bad boy awesomeness. The secret ingredient is graham crackers, believe it or not, which coats the chicken in a sweet, salty breading that leaves you without a problem in the world. Seasonings (to taste): basil, salt, rosemary, or whatever you like. Preheat oven to 375. Put 4 Tbs butter in a 9×13 pan, and place the pan in the oven as it’s preheating so the butter melts (don’t let it burn!). Remove the pan from the oven and swirl the butter so it coats the bottom of the pan. Meanwhile, peel and slice the potatoes. Line bottom of pan with potatoes, top potatoes with corn. Season to taste with salt, pepper, and basil (at least 1 tsp of each). Crush the graham crackers (I like to put mine in a ziplock and roll them with a rolling pin). 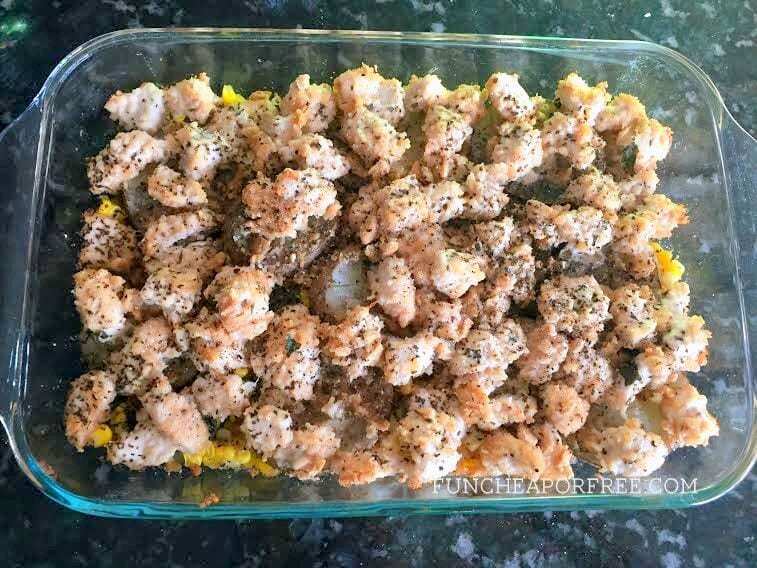 Combine cracker crumbs with seasonings as desired. Again, I suggest 1 tsp of salt, basil, and a pinch of rosemary. Dice chicken or cut into strips. Dip chicken into 4 Tbs melted butter, then coat completely in crumb mixture. 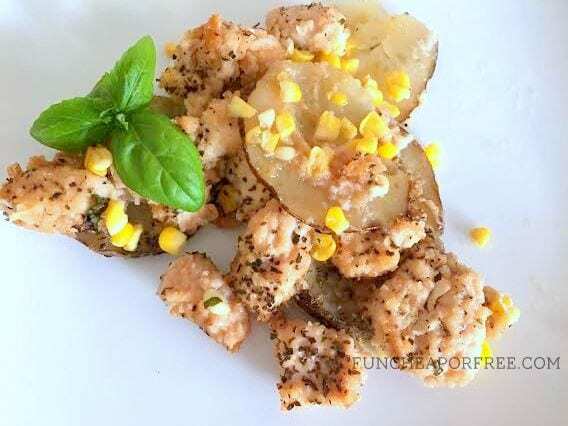 Place chicken on top of corn and potatoes. Sprinkle extra crumb mixture on top of the potatoes/corn. Trust me, it’s delicious. This time I really made the chicken chunks small as an experiment. It was so good that way! They didn't dry out, and my kids preferred it because every bite was coated in crumbs. Just don't overcook the chicken! 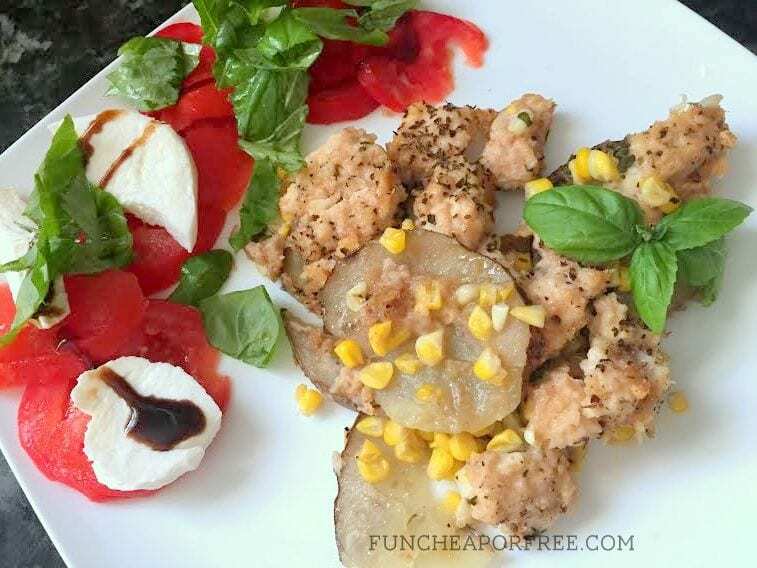 Cover and bake 45 minutes or until chicken is done and potatoes are tender. NOTE: This will greatly depend on how big or small you cut your chicken, so just keep an eye on it! Uncover, and bake for 10 minutes more to brown the chicken. Eat, and tell all your friends how awesome you are. We normally eat it with a green salad, but that night I was feeling Caprese, baby! Not sure if it really works like I picture it working, it's not proven or anything. It just makes me feel cool. Either way, it's simple and delicious so I hope you love it! Pssst…Check out my other favorite recipes while you're at it. Bomb Shelter Baby is Hiring! NO WAY! I’m so sad about that! You could use Ritz crackers. Or any other crackers for that matter. Maybe mix a little honey in the breading? The graham is slightly sweet and added to the salty is mmmm mmm good. I’ll bring you graham crackers if I ever come to visit! Looks so good! Going to make it this weekend! Did you know you can cook corn on the cob in the microwave and it tastes just like you boiled it?! Wrap each cob in a damp paper towel and cook for 2 minutes per cob. Great time saver! You can cook corn on the cob in the husk for 3 minutes in the microwave. When done cut the stem end at kernels and pull the hairs and husk all off as one! WHAT?! Love that, I’ll have to try it! Looks great and so easy! I’ll have to give this a try! Just tried this for dinner tonight. It was amazingly delicious! I wasn’t sure how the graham crackers were going to work out, but they make it so good. Thanks for sharing! Hey Jordan! I tried this recipe tonight (smelled so good!) but my potatoes took fo-ev-ah to cook. It started drying out the chicken and I finally had to take all the chicken pieces (cut up small like you did) and put the potato mixture back in for a third time. 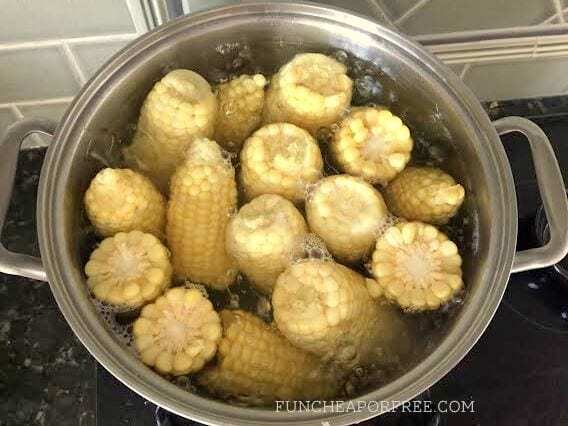 I drained my corn…is that why the potatoes didn’t cook? Help! Oh no! I’ve never had that problem before. Did you slice them SUPER thin? Like as thin as poker chips? That’s how I do it and it never seems to be a problem. Maybe bake them without everything on them first for a few minutes then add the chicken if it continues to be a problem! Thanks girl! Yeah, I sliced them really thin, like for au gratin potatoes. So weird. I’ll maybe cook them separately for a bit next time and see how they do. P.S. It was really yummy! Can’t wait to try this! Thank you! I made this tonight and it was good, but I felt a whole tsp of pepper was a bit overpowering on the potatoes, I would do half or less next time for sure! Otherwise tasty, thanks!